Campus ministry to international students is flourishing in Minneapolis thanks to a partnership with Mission Field: USA. How do I find truth? Why does God allow evil in the world? What is sin, and why is it important? How does one man save me from this? What makes Christianity any different from other religions? These are some of the big questions asked by international students who attend the University of Minnesota, Twin Cities. God’s answers — or at least guidance — are available. The Rev. David Kind, pastor of nearby University Lutheran Chapel (ULC), is equipped and ready to teach God’s Word. The problem, however, is that Kind often doesn’t know these students, and they don’t know where to find him. God has provided that needed connection in Rebecca Wagner, an LCMS national missionary who serves alongside Kind at ULC and focuses on outreach to international students. 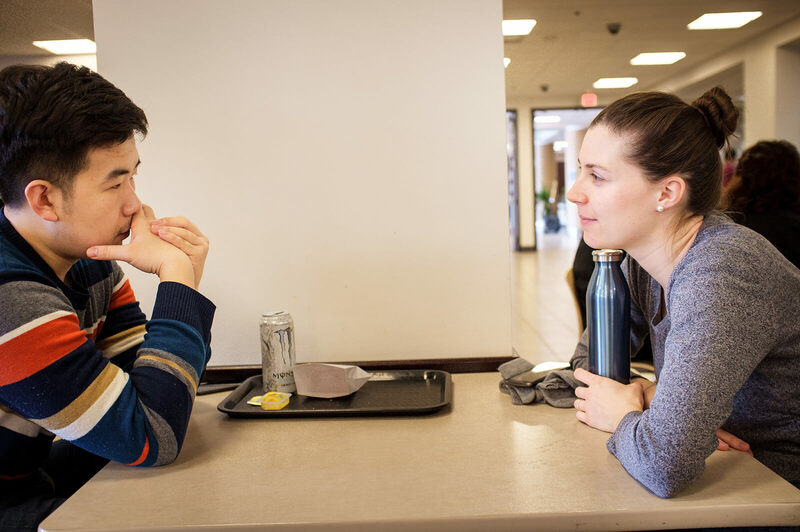 Rebecca Wagner talks with Juncheng, a Chinese student studying philosophy, over lunch at the university. In August 2016, Wagner began serving at ULC as the Synod’s first national missionary to Minneapolis. 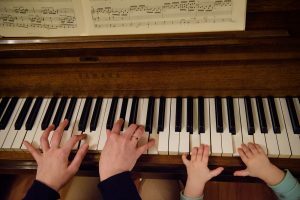 She was already familiar with the ministry, since she had been attending events there while working at a local Chinese and Spanish immersion school. Wagner brings not only genuine friendliness but also the ability to speak Mandarin Chinese and Russian to the role. This unique combination helps her bridge cultural gaps and make friends with many of the international students. Kind was eager for the assistance. As ULC’s only staff member, he shepherded a congregation of 140 members, ran an active campus ministry for American students, and supervised Luther House — a former sorority house-turned-bed-and-breakfast that ULC purchased and renovated. The top floor of the building now houses six students who are involved in the campus ministry, while the ground floor provides space for ULC’s many Bible classes, free meals and game nights. The Rev. 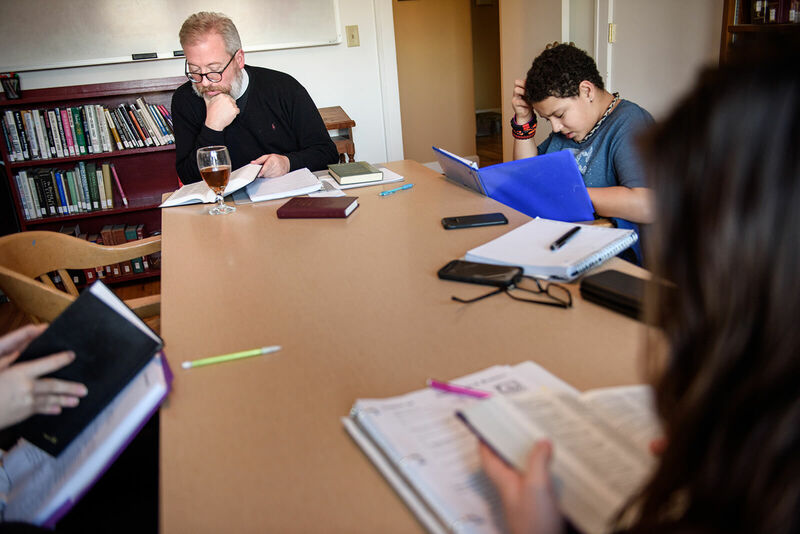 David Kind leads a confirmation class at Luther House in February. “There was just no way for me to do international outreach on top of what I was doing already,” he says. But he knew there was a great opportunity to share the Gospel with international students at the university. The Twin Cities campus hosts nearly 6,500 international students from 130 countries, and almost half of these are from China. Kind talked with his district mission executive, and together they approached the Rev. Dr. Steve Schave, director of LCMS Church Planting and Urban & Inner-City Mission, about bringing a national missionary to the campus through the Synod’s Mission Field: USA initiative. The initiative provides resources to support church planting in the LCMS, while also partnering with ministries and districts to send national missionaries to underserved areas. Watch as the Rev. David Kind and Rebecca Wagner describe the ministry in Minneapolis. During the week, Wagner can often be found meeting one-on-one with students on campus, in coffee shops, at Luther House or in her own home. These discussions are guided by what the students want to talk about. When Wagner meets with Juncheng, a Chinese student studying philosophy, they often talk about Western morality. During a recent discussion, Wagner turned to the Ten Commandments and to what Jesus says about them in her bilingual Chinese-English Bible. When she meets with Peiqi, they are able to encourage each other as sisters in Christ. As a Chinese Christian, Peiqi is eager to make Christian friends on campus, and she attends the weekly international Bible study at ULC. 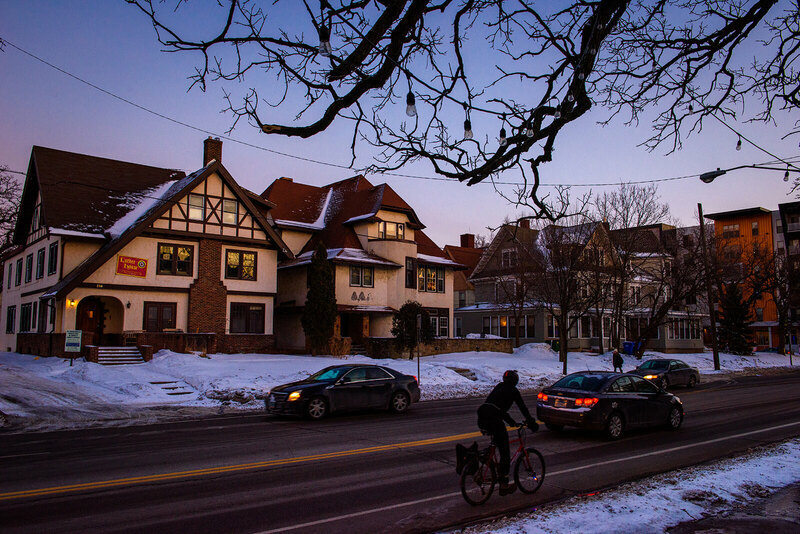 Evening descends over Luther House in February. Sometimes, students seek Wagner out specifically to talk about Christianity. “Last year, there was a student from Saudi Arabia who came up to our table at the student activity fair and said, ‘I would like to find somebody to study the Bible with,’” Wagner recalls. Although Wagner often brings up her faith in these meetings, she’s quick to note that she isn’t trying to teach theology. Instead, she’s making friends, sharing in the struggles and joys of their daily lives, and sharing her faith as appropriate to each conversation. When students are open to learning more about the church, Wagner connects them to ULC’s activities and to other Christian students. 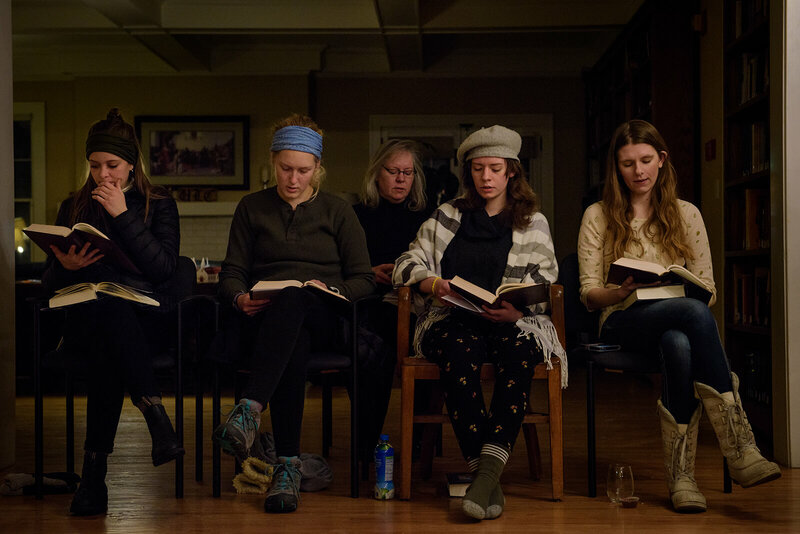 Some international students attend Kind’s weekly international Bible study. For those who have good English skills and want to dig deeper, he invites them to join an adult instruction class, even if they aren’t looking to join the church. 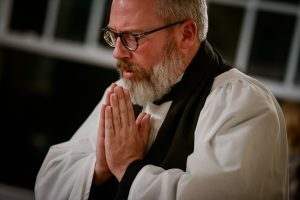 According to Kind, life at ULC “centers around the Divine Service.” There’s also Matins on Monday mornings, Vespers on Wednesday evenings and Bible study on Fridays. Plus, there are ample opportunities to grow in fellowship throughout the year through sledding activities, retreats, free meals and other events. Wagner’s favorite event of the school year was when she took a group of Chinese students to visit an LCMS church in the country that was having a German festival and potluck. Kind encourages congregations that want to get involved to start in a simple way. 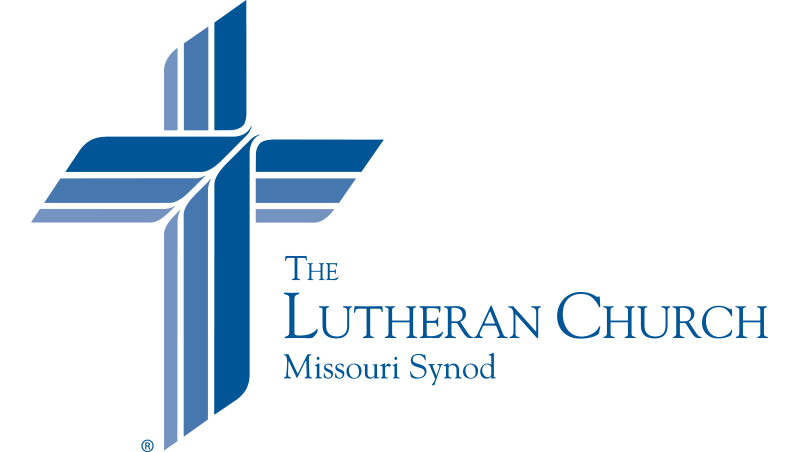 Reach out to your local Lutheran campus ministry and offer to cook a meal or invite them to bring students to your next event. Even though American students often are ambivalent about Christianity, Kind says that international students are “such a joy” because they are so eager to learn. Wagner agrees, noting that the world is coming to their doorstep in Minneapolis. From Open Doors® 2017 Report on International Education Exchange, published Nov. 13, 2017. Lord of the Church, our only hope for salvation, watch over those who care for Your loved ones as they attend college, especially those at University Lutheran Chapel and the University of Minnesota, Twin Cities. Strengthen Pastor David Kind as he serves through Word and Sacrament ministry. Bless also the work of Rebecca Wagner as she forms friendships and reaches out to students from different countries. May Your Kingdom continue to grow in people’s lives through this ministry and through all who spread Your Word and witness to Your love, O Jesus, who with the Father and Spirit reigns forever and ever. Amen.